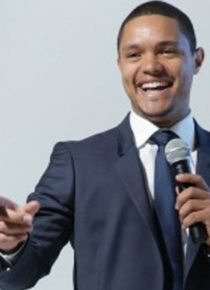 Trevor Noah is the favorite South African comedian who has sold more DVDs than any other standup on that continent. Fans recite his performances verbatim, share his clips globally, and have joined him in legions on Facebook and Twitter. Noah has hosted numerous television shows in South Africa, including the country’s music, television and film awards, the South African Comedy Festival, and two seasons of his own late night talk show. He is also the subject of the award-winning film Township to the Stage which tells the story of his remarkable career in post-apartheid South Africa. Noah had his U.S. television debut on The Tonight Show with Jay Leno in January, which prompted multiple invitations to return and appear in signature sketches. He toured America with stand-up star Gabriel Iglesias playing to packed houses in the thousands, and headlined club venues winning over audiences at every stop. Noah presented his one man show “The Racist” at the 2012 Edinburgh Fringe (presented by icon Eddie Izzard) in a sold out run that became the buzz of audiences and journalists. Along with a recent article in Newsweek, Noah was a guest on NPR’s Talk of the Nation, and is guesting on the BBC Radio’s Front Row. Having just completed an unprecedented three month run across South Africa and Sub-Saharan Africa, Noah is appearing in a six week sold out run at London’s Soho Theatre.